Jojoba oil (pronounced ho-ho-ba oil) is a liquid wax extracted from the nuts of the jojoba plant grown in Southwestern states of USA. Jojoba oil is a versatile healing oil that closely resembles sebum (an oil produced by our skin glands). It acts as a natural skin conditioner that helps protect and heal the skin from external toxins. It also contains essential vitamins such as Vitamin B, E and key minerals such as zinc, copper that are very important for our skin. It can be used directly without dilution. At the same time, jojoba oil is a good carrier oil for several essential oils. Jojoba oil keeps the skin hydrated by locking in the moisture and creates an effective barrier to external elements. Jojoba oil can help reduce oiliness in the skin by modulating the sebum production. Jojoba oil has antibacterial properties that help control bacterial growth and prevent acne formation. 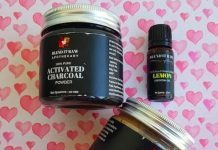 It acts as an anti-inflammatory agent and helps soothe the irritated skin. Jojoba oil can heal the chapped lips and protects the lips from the drying effects of cold and wind. It forms a barrier that effectively locks the moisture in and keeps the lips soft and supple. It has anti-inflammatory and antibacterial properties and thus helps prevents bacterial infections causing dandruff and itchy scalp. It also acts as a good cuticle oil. 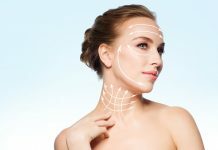 It acts as an anti-aging moisturizer. The essential vitamins present in Jojoba oil help reduce wrinkles and the visible signs of aging. It can be used as a natural makeup remover. The inflammation caused by sunburn can be relieved by applying Jojoba oil over the affected area. It helps moisturize and condition the dry and dull hair, leaving it more manageable and frizz free. It reduces hair fall and promotes healthy hair growth. 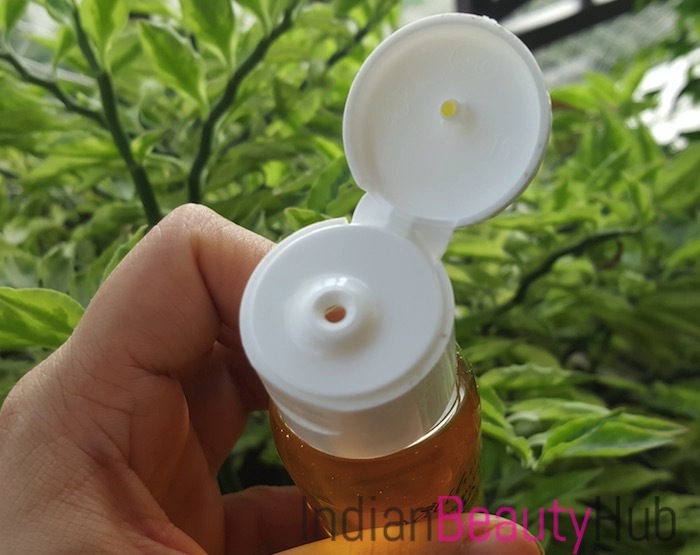 Packaging: Satthwa jojoba oil comes in a tiny plastic bottle with flip open cap. A plastic lid is placed inside the mouth of the bottle to prevent leakage. 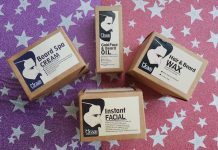 The packaging is compact, sturdy and hygienic to use. The product related brief information is also given on the bottle. The only issue with the bottle is that it is not completely spill-proof and the oil can spill out of the bottle if not handled carefully. 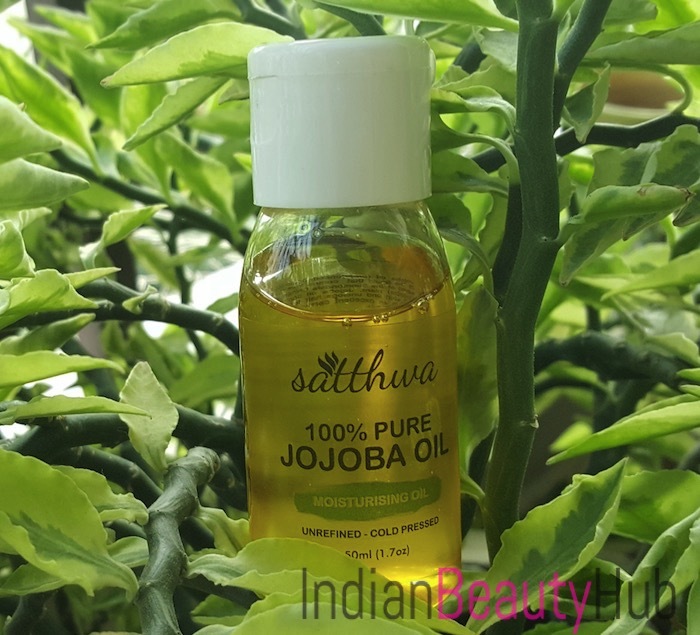 Price & Availability: The price of the Satthwa 100% Pure Jojoba Oil is Rs.499 for 50ml (currently it is available at discounted price of Rs.380). It can be bought online from Amazon.in and Flipkart.com. Visit Satthwa’s official website satthwa.com to know more about their products. 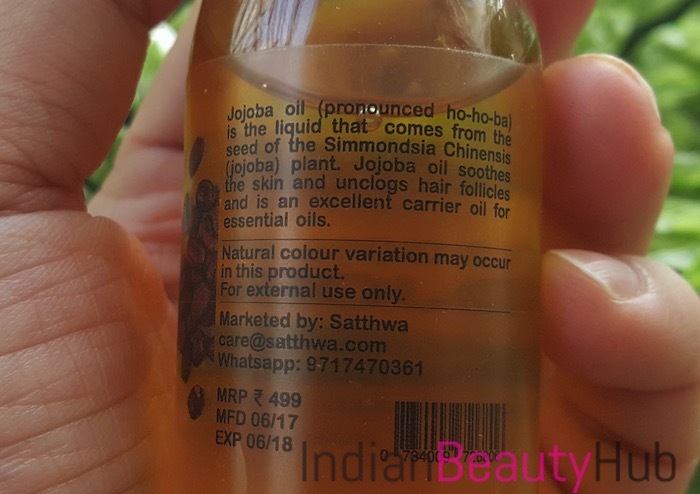 My Experience: The jojoba oil comes in a golden color and has a nutty scent which is not very strong though. It has a slightly thicker consistency like a liquid wax. I usually apply this oil during night time before going to bed. After cleansing and toning, I rub 4-5 drops of the oil in my palm and massage it nicely on my face including the neck area. It absorbs completely into the skin and instantly moisturizes the dull and dehydrated skin. Even though I have combination skin (oily t-zone with dry cheeks) but it doesn’t make my skin greasy. It takes care of dry patches effectively and also helps to reduce the skin irritation like sunburns, redness. I also use this oil as a cuticle oil, I massage my cuticles for 2-3 minutes daily with it. I also massage it on my feet and hands before going to bed. It takes care of dry cuticles and promotes nail growth. Jojoba oil can also be used as a lip treatment to heal dry and chapped lips. Lastly, I use it for my hair by mixing its 5-6 drops with leave-in conditioner and apply it on my hair. It does a decent job in taming the frizz and moisturizing dry hair ends. I didn’t find it very effective in curing dandruff. 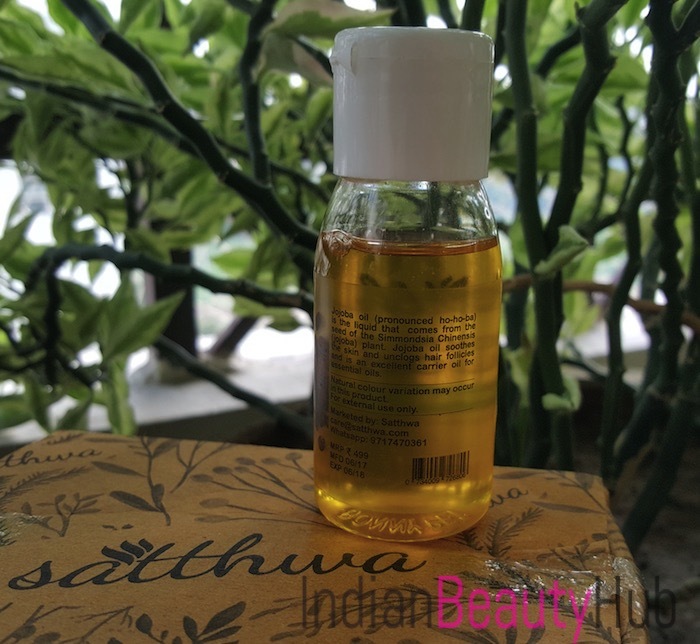 I found Satthwa Premium hair oil much more effective for dandruff prevention. 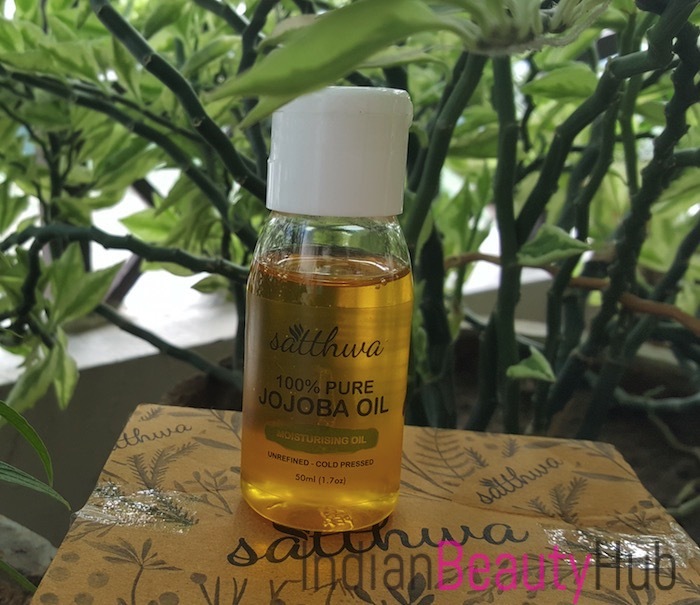 Overall, Jojoba oil is versatile healing oil that can be used to treat various skin and hair problems. It moisturizes, heals, and protects skin from many external elements. 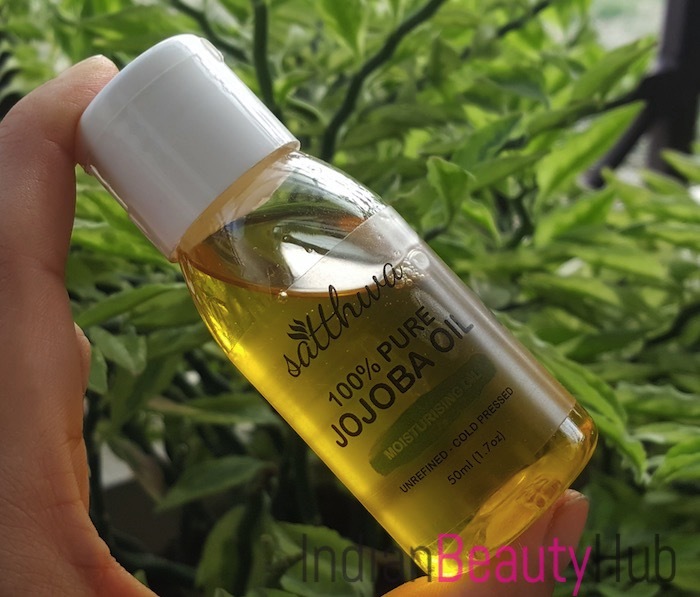 Everybody should definitely include jojoba oil in their daily skin care routine. 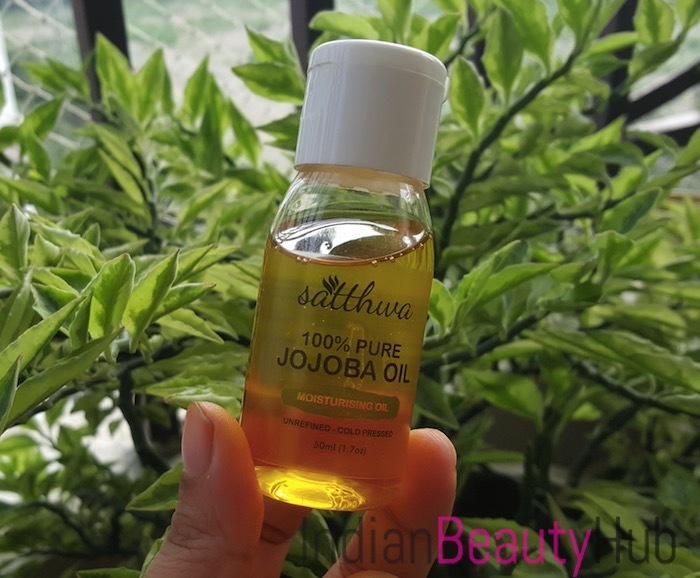 You can consider buying Satthwa jojoba oil because it is 100% pure and also not very expensive. Recommended! I just love Satthawa Hair oil. It is really an effective one.